B.C. Rich Bich Perfect 10 - "A beautiful, versatile guitar with an edgy look." B.C. Rich NJ Classic Mockingbird - "very moody sound"
B.C. 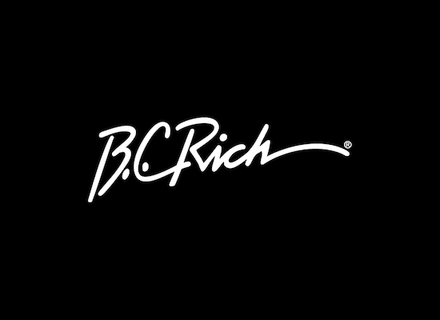 Rich Bronze Bich - "Low end Bich"
B.C. Rich Stealth Chuck Schuldiner Tribute - Onyx - "Custom shop Chuck model." B.C. Rich Bich Exotic Classic 10 Koa - "Exotic 10 string Bich"
B.C. Rich Condor - "Decent guitar"
B.C. Rich Warbeast Bloodbound - "Lower quality BC Rich"
B.C. Rich Stealth Chuck Schuldiner Tribute - Onyx - "Chuck's signature guitar"
B.C. Rich Mockingbird Masterpiece - "Great features but somewhat subpar"
B.C. Rich NJ Warlock Neck-Thru - "Extreme metal look"